Another look for the emerging sneaker. Following up a first look, Nike‘s women’s exclusive React Element 55 “Black/Volt” now has an official release date. Shortly after learning of a “Mica Green” colorway, we can now expect the arrival of another two-tone contrast look for the emerging silhouette. This time around the woven material base upper is done in a pure black color complete with neon hits on the eyestays and heel. Branding on the shoe comes in the form of large grey midfoot Swooshes with some “Volt” Nike React tags on the tongue. Finishing up the design of the colorway is a white take on Nike’s newly-developed, drilled React sole unit, complete with matching neon embedded rubber segments. 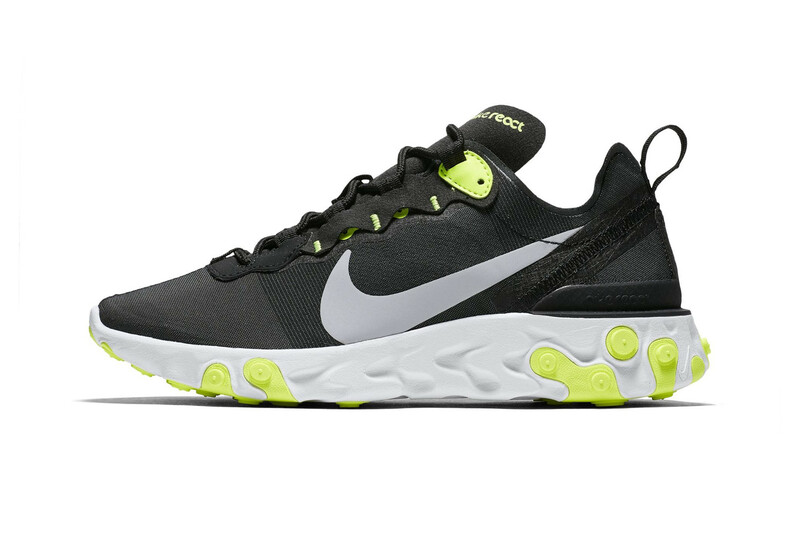 Priced at $130 USD, the Nike React Element 55 “Black/Volt” is set to release October 23 at select retailers. For more Nike, make sure to check out the “Mica Green” colorway of the React Element 55 set to release. Sharing the stage for the first time ever. A first look at the upcoming collaborative footwear. Commemorating the basketball player’s legacy and 21-year history with the brand. In honor of the artist and his debut album. Using concrete and glass to expertly balance private and communal spaces. Watch the incident during Ralph Lauren’s 50th anniversary fashion show.